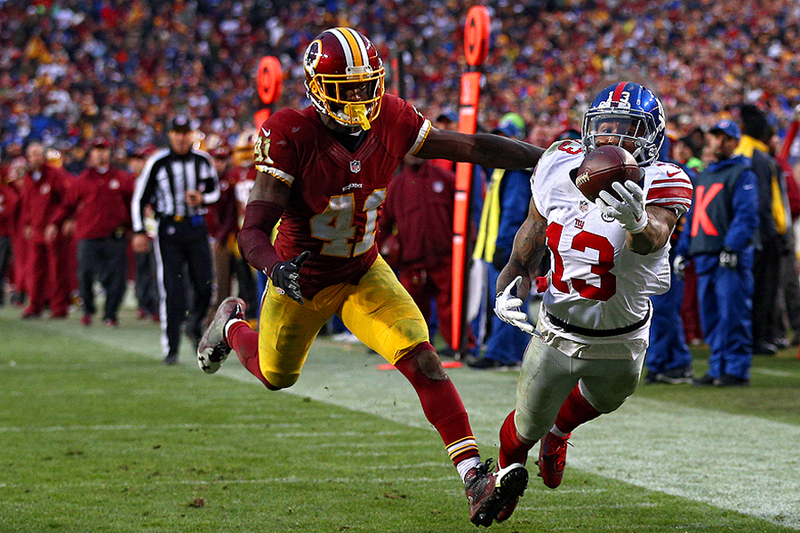 "Wide receiver Odell Beckham #13 of the New York Giants scores a fourth quarter touchdown past cornerback Will Blackmon #41 of the Washington Redskins at FedExField on November 29, 2015 in Landover, Maryland." If you've heard of the name Odell Beckham - you've certainly heard the hype surrounding his 2014 one-handed catch. In little words as possible, it was a super-human catch by a tremendous athlete. And as a photographer, you think of the catch whenever you photograph any game. Why? Because it was a regular season game, in which Beckham's team, the New York Giants, lost. Yet the catch made headlines everywhere. And more importantly, the video and still images were used all over the world. It goes to show that at any given game, at any given moment, the next big play could unfold right in front of your lens. Last Sunday, while still an amazing athletic performance, Beckham tried to one-up his last season's catch against the Washington Redskins. Not nearly as viral, it still made for a stunning picture and restored that notion in every photographers head to be ready at all times - whether it's Beckham - or another superstar.